The next few weeks are busy ones for CNYO and amateur astronomers in general. 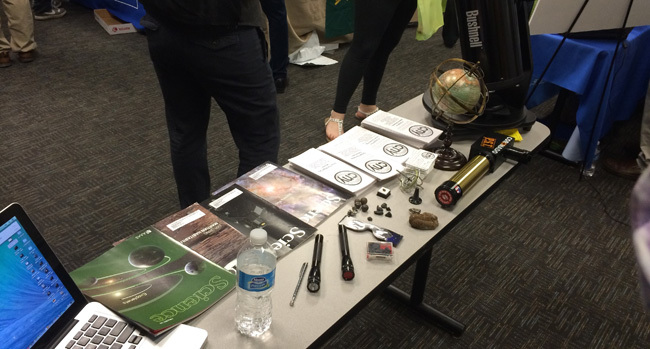 A piece of Mars, some meteors, several magnets, terrestrial rocks with larger meanings, four things we didn’t know “when I was their age,” and additional makings of a set of STEM astro demos. But back to the eclipse and opposition. It is my opinion that lunar eclipses don’t get the respect they deserve. Yes, solar eclipses are much more exciting and it has been well-documented that people have previously responded very strongly (and not always pleasantly) to solar eclipses. The sudden darkening of the sky and noticeable temperature drop can cause all shades of responses (no pun intended) in people. That said, all we really get (besides a view of the solar corona) is an example of what happens when you put a black disc in front of the Sun. Lunar eclipses, on the other hand, tell us a bit about how the Earth itself interacts with the Sun by how this interaction alters our view of the Moon. Both solar and lunar eclipses tell us something about the Sun/Earth/Moon relationship. Specifically, we learn that the Sun/Earth orbital plane (the oval made as the Earth goes around the Sun each year) and the Earth/Moon orbital plane (our local oval) are not the same – the Earth/Moon plane is tilted slightly off the Sun/Earth plane by 5.2 degrees (small, but just enough). That is, the Moon spends some time above and some times below the Sun/Earth orbital plane, while sitting right in the plane only two times each orbit (where the two planes intersect). How do we know this? Simple. If the Earth/Moon plane were exactly in the Sun/Earth plane, there would be a total solar eclipse and total lunar eclipse every month because there would be a time each month (New Moon) when the Sun, Moon, and Earth made a straight line (Sun-Moon-Earth = solar eclipse) and a time each month (Full Moon) when the Sun, Earth, and Moon made a straight line (Sun-Earth-Moon = lunar eclipse). As the two planes are slightly off, the New Moon is simply “off the radar” of most people because it can’t be seen during the daytime. The Full Moon, on the other hand, is brilliantly bright most of the time because it only infrequently enters the Earth’s shadow. The image below shows this very nicely (and it’s always better to find and cite a good image than to have to roll your own). Give it a look for 30 seconds to make sure each of the four cases make sense to you. The Sun/Earth and Earth/Moon orbital planes. Note the top and bottom orientations that are perfect for eclipses (and the left and right that are not). Image taken from www2.astro.psu.edu (from Chaisson & McMillan Publishing). Click for a larger view. Total solar and lunar eclipses, then, occur on special, but periodic and predictable, occasions when the Moon finds itself exactly in the Sun/Earth plane. When it’s just ever-so-slightly off this plane AND still between the Sun and Earth (or still falls into the Earth’s shadow in the Sun-Earth-Moon arrangement), we get partial eclipses. Just that simple. What to expect on April 15th (the government’s cashing in on its short wavelength tax!). Image from this article at io9.com. Perhaps the most striking difference between a solar and lunar eclipse is that a solar eclipse obstructs the disc of the Sun, leaving only a view of its wispy exterior (corona), while a lunar eclipse alters the color of the Moon while still allowing us to see it in its entirety. Those watching the lunar eclipse will see the Moon go from its usual bright grey to orange, then a dark red before reversing the color order. The reason for this dark red coloring is the same reason why our sky is blue – the scattering of light in our atmosphere. Recalling our handy scattering relationship – that scattering (I) is proportional to 1 / wavelength4, we see that shorter wavelengths scatter more than longer wavelengths (because the wavelengths are in the bottom of the proportion, so larger numbers decrease the value of “I”). The image below was taken from one of the great non-wikipedia physics sites (well worth several afternoons to explore), hyperphysics.phy-astr.gsu.edu. The scattering relationship. See hyperphysics.phy-astr.gsu.edu/…/blusky.html for much, much more. We see that shorter wavelength light gets “bounced around” more, while longer wavelength light passes for longer distances unimpeded by interactions with molecules and larger particles (like soot after big volcanic eruptions) in our atmosphere. 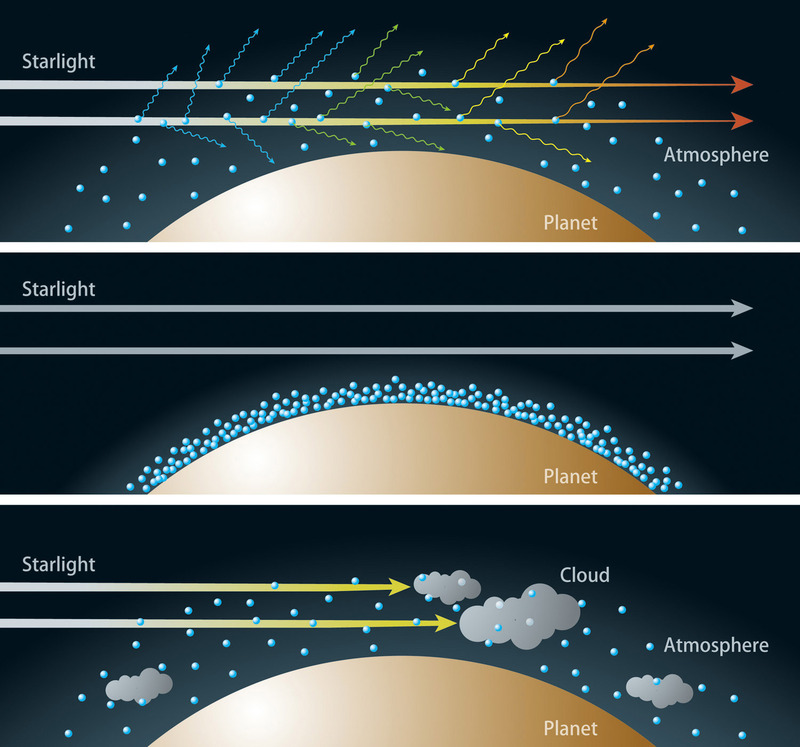 Light going straight from the Sun hits our atmosphere and gets increasingly scattered as wavelength gets shorter – blue scatters more than red, so we see the blue strongly when we look up during the day. With the blue light strongly scattered, those people on the edges of where the Sun’s light falls – those just starting or ending their days – see more red light because that wavelength wasn’t as strongly scattered – effectively those at sunrise and sunset get the filtered-out leftovers of the light that those at high noon see as blue. The “lit” side of the world experiences a range of different colors depending on where they are during the day, but all are being illuminated by waves of light from the Sun that left at the same exact time (plus or minus a nanosecond or two). Because it’s a busy week and the author is feeling lazy, he refers you to the top image of the three-panel image below, showing how the scattering of sunlight in our atmosphere occurs sooner after entry (on average) for blue, a bit later (on average) for green, then a bit later (on average) for yellow, then out to red, some of which is and isn’t scattered (on average). The scattering of light by Earth’s atmosphere (shorter wavelengths scatter sooner). The other two images are placed into context by your reading about extrasolar planetary atmosphere studies. See www.universetoday.com/…-in-blue-light/ for that info. And so, we know that blue is scattered strongly and red is not. This red light then races to the edges of our illuminated globe and the red light not scattered directly down to Earth or scattered in the opposite direction (out into space right above you) races past Earth at various altered (scattered) angles. During the most complete part of the lunar eclipse, the red color you see is, in fact, the red light that is passing through the edges of our atmosphere at those places experiencing sunrise and sunset (the sunlight performing a “grazing blow” of our atmosphere). As you might guess, if Earth were to lose its atmosphere (but don’t give any of your industrious friends any ideas), our lunar eclipses would appear quite different. Instead of a dark red Moon, we’d simply see a black disc where no stars shone (like placing a quarter at arms length and obscuring anything behind it). This lunar eclipse just happens to coincide with another special event in our Solar System that just passed on April 8th – Mars at Opposition. Earth-centric oppositions occur when the Sun and a planet (from Mars out to Neptune, then dwarf planets, comets and asteroids also fit the description) are on opposite sides of the sky to one another (this cannot happen for Venus and Mercury to an observer standing on Earth – this also means that Earth is never “at opposition” for Mars). This necessarily means that, when this occurs, the Earth and that other object are as close as they will get for that Earth year. Because our orbits are not circular around the Sun, our distances at opposition do vary. 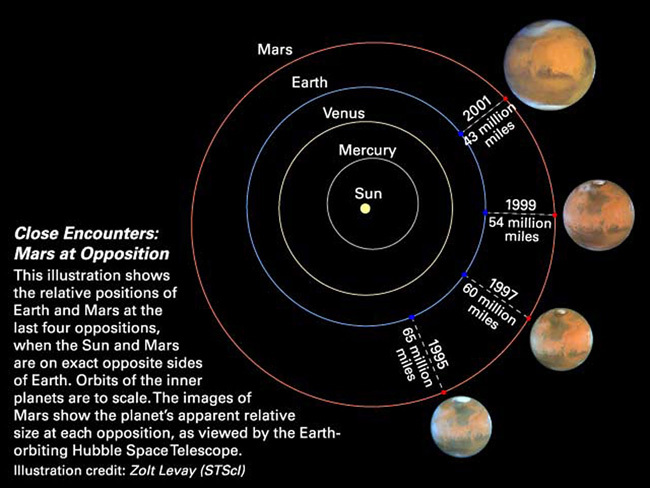 The slightly outdated image below shows this difference of opposition distances for Mars from 1995 to 2001. August of 2003 was our closest approach (34 million miles) to Mars in roughly 60,000 years, making for some impressive views through even medium-sized scopes. Mars distances at four oppositions. Image taken from the Hubble Space Telescope website. Click for a larger view. What does this opposition mean for us? For those attending Baltimore Woods for Bob Piekiel’s special Lunar Eclipse observing session on the (really early) morning of April 15th (that is, we’ll be set up from 11:00 p.m. on the 14th and hanging out until it’s over), this means that Mars will be just a few days past its closest approach to Earth, making for especially good views through the scopes in attendance. Add Jupiter and Saturn over the course of the lunar eclipse, and we’ve a small feast of planetary observation for the evening. We hope you can join us! Upcoming Events: Baltimore Woods This Friday, Star Search! @ Green Lakes, NMT @ MVAS, And A Photo-Op From Saturn! The weather-alternate is Saturday, July 13th. Several CNYO Observing Logs have been produced from these sessions this year already (1, 2, 3, 4) and we hope for clear skies this weekend to take in some prime Summer views of Saturn, the center of the Milky Way, and the many clusters and nebulae therein. Details about this event (directions, fees, etc.) are available @ THIS Link. The weather-alternate is Saturday, July 27th. This is a free observing session at one of the gems of our local state park system (although you won’t be able to appreciate much of it unless you get there early) hosted by CNY’s own Bob Piekiel. The poster for this event, start-end times, and directions are available @ THIS Link. NOTE: While the temperature might beckon shorts and T-shirts, I bring you this word of caution from Dr. John McMahon: Green Lakes is one of the areas identified in Onondaga County where Black-legged Ticks (Ixodes scapularis) — aka deer ticks –have been identified as being abundant. He (and I) refer you to the following NY Department Of Health sites for more info. In short: Bug spray ( I will have a DEET-free bottle on hand) and long sleeved everything is the order of the night (including tucking pants into socks. Remember, it’ll be dark. No one will see you). Mark your calendars! Ryan is presently scheduled to give a one hour lecture for the Mohawk Valley Astronomical Society on Wednesday, September 11 at 7:30 p.m. We do not know know if this will be open to the public or just to MVAS members, so you should consider joining and supporting this very active and very knowledgeable organization to our east. I consider their monthly newsletter – Telescopic Topics – to be one of the very best amateur astronomy club newsletters out there. This month’s edition includes Ryan’s article “Going Big” – posted on the CNYO site this past June 27th. We will provide more details on the CNYO site as the date approaches. The Cassini Space Probe is set to image Saturn as Saturn occults (that is, passes in front of in a “greater than” eclipsed manner (although I’ve seen it described as “eclipsing”). This is not a transit, as the Sun will not be directly visible behind Saturn, and a transit requires that the “passing” object be smaller than the object being passed) the Sun (from the vantage point of the probe, that is) on July 19th. This is guaranteed to be a spectacular image of Saturn by all metrics (anyone who’s seen the image serving as this post’s banner knows what a remarkable combination Saturn and sunlight are). It just so happens that this will occur (1) while the Earth will be in the field of view of the probe’s imagers and (2) while the North American continent is being illuminated by sunlight. The images below (from NASA/JPL-Caltech) summarize the situation on the 19th. If we don’t host an official event (it is cutting it close to quittin’ time, after all), consider getting outside for a few minutes of Saturnian exposure and give your tax dollars a big wave. The Voyager delivery accuracy at Neptune of 100 km (62 mi), divided by the trip distance or arc length traveled of 7,128,603,456 km (4,429,508,700 mi), is equivalent to the feat of sinking a 3630 km (2260 mi) golf putt, assuming that the golfer can make a few illegal fine adjustments while the ball is rolling across this incredibly long green. I include this piece of historical content to put into context any discussion about a 2012 DA14 impact (which, at this point, falls clearly into the conspiracy theory regime). The world has a very good handle on Newtonian Mechanics and, when it is reported by NASA physicists that something is going to miss the planet by 27,000 km (OK, fine. 27,000 km from the Earth’s center. As the point on the Earth’s surface farthest from the Earth’s center is 6,384 km away, DA14 will miss by “only” 20,616 km), you can believe it. If we can be off by 100 km after 12 YEARS in space, be assured we can be within that same 100 km with a year’s worth of data collection. As the newest reports about 2012 DA14’s path make clear, its passing within geosynchronous orbit will be a treat for observers in Indonesia and an otherwise great view for Europe, Asia, and Africa. And by great, I mean that the predicted apparent magnitude will not reach smaller than 7.4 (smaller = brighter. Naked Eye viewing trails off rapidly after magnitude 4, making 2012 DA14 a “big binocular” object even at its closest approach. The Sun, on the other hand, is at magnitude –26.74 from Earth), so it will be great with the aid of optics. CNY, and the Americas in general, will only be able to observe 2012 DA14 on its “way out,” after closest approach. As it will be moving at quite a clip away from us, it will be quite a difficult object in CNY to find for anyone outside on the night of the 15th. Reports seems to indicate it will be at magnitude 11 by the time the East Coast could see it, which is a heroic magnitude for most any amateur telescope). 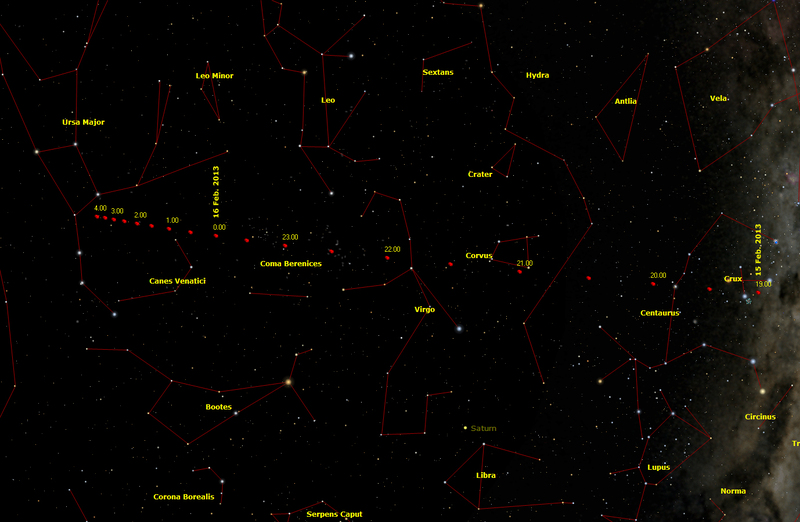 CAPTION: Path of 2012 DA14 (in Universal Time (UT) and as viewed from the Earth’s Center) on February 15/16. Click for a full-sized version. From www.virtualtelescope.eu. And, if you’re still freaked out about impact, note that we (CNY) will STILL be on the wrong piece of Terran real estate. That said, its trajectory is even wrong for colliding with geosynchronous satellites, so your cell phone service won’t be impacted, either. I am pleased to report that the best 4 minute discussion of 2012 DA14 has been put together by an organization I’ve been a member of for over 15 years – The Planetary Society (co-founded by Carl Sagan, currently CEO’ed over by Bill Nye, the list of activities in space science and public outreach is considerable). Bruce Bett’s youtube video is provided below. If Snow Storm Nemo has anything to say about it, you’ll have plenty of time this weekend to watch and take notes. CAPTION: Planetary Society Director of Projects Bruce Betts reassures us in this brief and fascinating explanation of what will happen–and what WON’T happen–when this big asteroid comes closer to Earth than many satellites. You can read a full article about 2012 DA14 at the Planetary Society website: www.planetary.org/explore/projects/neo-grants/2012da14.html. A thorough FAQ can be found at www.planetary.org/explore/projects/neo-grants/2012-da14-faq.html.